MINI is getting bigger, starting with the Roadster and then the Paceman. The big news out of BMW this week is that MINI is growing. The MINI Roadster that just made its official debut at the 2012 Detroit Auto Show is scheduled to arrive this February in the U.S., while a coupe version of the Countryman crossover, dubbed the Paceman when it made its debut at last year&apos;s Detroit Auto Show, could arrive as soon as early 2013. A second-generation MINI Cooper hardtop is also expected to arrive by 2014. The new Cooper should run on BMW&apos;s new FWD platform. The Paceman Concept will be known in the States as the Countryman Coupe. As a two-door variant of the original four-door Countryman, it could retain the concept&apos;s JCW-built 1.6-liter twin-turbocharged engine that put out 211hp and 192 lb-ft of torque. It also featured an Overboost function, allowing for a short time torque boost of up to 207 lb-ft. 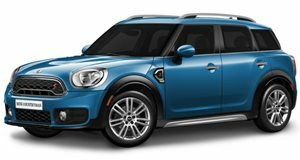 According to a report by AutoNews, Jim McDowell, MINI chief in the U.S., said that 40 percent of MINI&apos;s sold in the U.S. were custom ordered and had an average price of $28,000. With three new models making for a total of ten available, customers should be able to customize many more MINIs for the years to come. Photos displayed are of the 2011 Mini Paceman Concept.